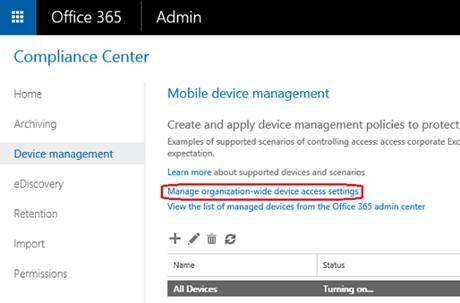 In the previous part of this article series we presented the new built-in Mobile Device Management (MDM) solution in Office 365, what it can be used for and we started configuring it. Now we will create our first security policy. 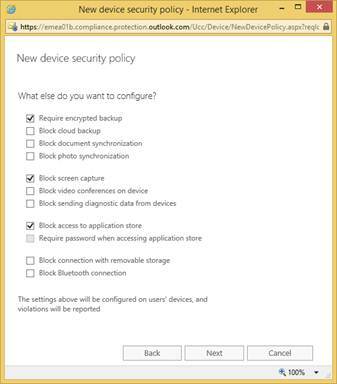 Before we start enrolling users’ devices, we need to create one or more Security Policies to enforce users to enroll their devices so we can manage them and protect our organizational data. 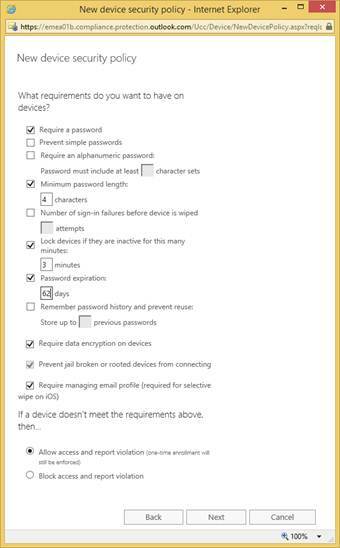 For example, to help prevent data loss if a user loses their device, we can create a policy to lock devices after 5 minutes of inactivity and have devices wiped after 3 sign-in failures. 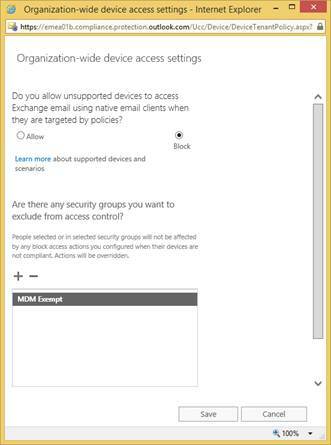 Please note that the policies and access rules we create in MDM override the Exchange ActiveSync mobile device mailbox policies and device access rules created in the Exchange Admin Center. 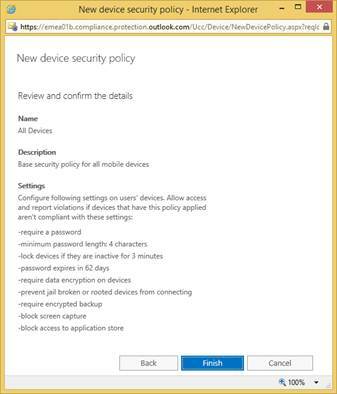 After a device is enrolled in MDM, any Exchange ActiveSync mobile device mailbox policy or device access rule applied to the device is simply ignored. 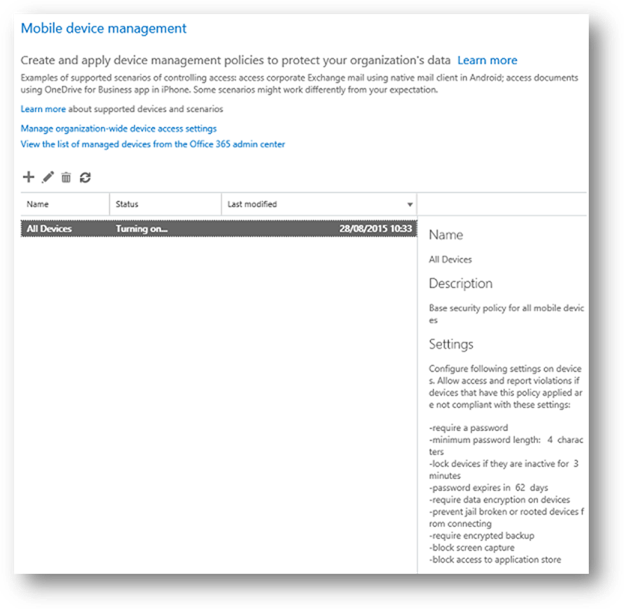 Before creating our first security policy, let us have a quick look at the settings we can use to help us secure and manage mobile devices. 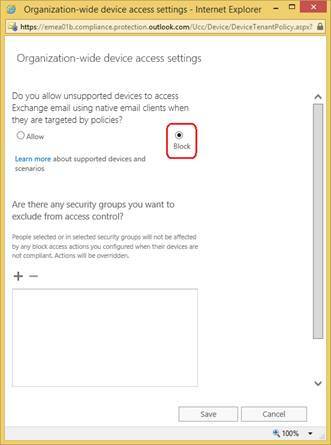 This option can block users from accessing their Office 365 email if they are using a manually created email profile. Users on iOS devices must delete their manually created email profile before they can access their email. After they delete the profile, a new profile will be automatically created on the device. 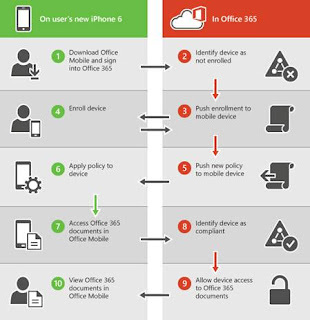 If a device is lost or stolen, we can remove organizational data and help prevent access to Office 365 resources by performing a wipe from Office 365 admin center >Mobile device management. As we will see later in this article series, we can perform a selective wipe to remove only organizational data or a full wipe to delete all information from a device and restore it to its factory settings. Let us now start creating our new policy. When creating a new policy, we can set it to allow access and report policy violation where a user's device is not compliant with the policy. This way we can see how many mobile devices would be impacted by the policy without actually blocking them. Select Ok, and then Next. Review and confirm the details of the new device policy, and select Finish. Select the name, and select Add. 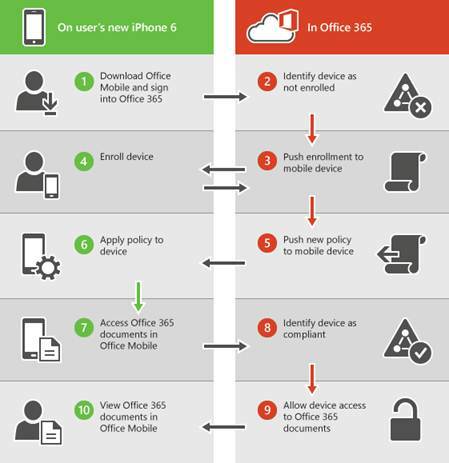 Each user that the policy applies to will have the policy pushed to their device the next time they sign in to Office 365 from their mobile device. 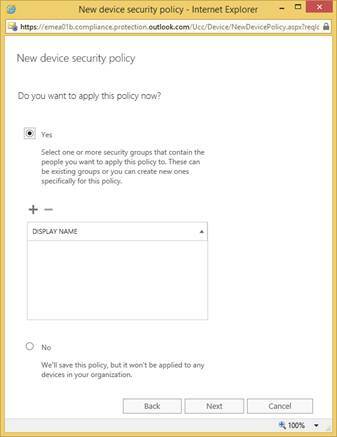 If users have not had a policy applied to their mobile device before, then after we deploy the policy, they will get a notification on their device that includes the steps to enroll and activate MDM. Until they complete enrollment, access to email, OneDrive and other services will be restricted. After they complete enrollment using the Company Portal app (which we will see in the next article), they will be able to use the services and the policy will be applied to their device. 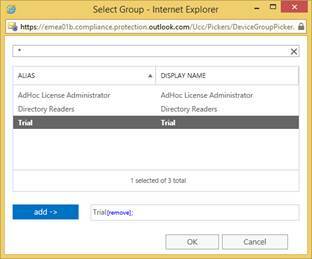 *If the policy was deployed with the option require managing email profile selected (as we did above), then the managed email profile and cached emails in that profile will be deleted from the user's device. 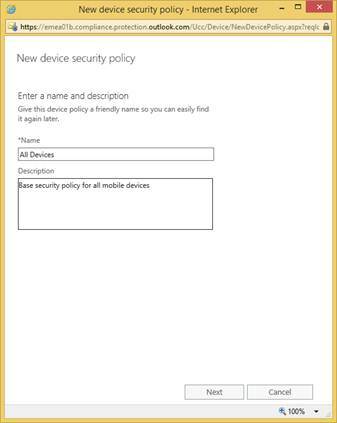 Each user that the removed policy applied to will have the policy removed from their device the next time their mobile device checks in with MDM. If we deploy a new policy that applies to these users' devices, they will be prompted to re-enroll in MDM. In this article we created our first security policy. In the next part we will start enrolling mobile devices.